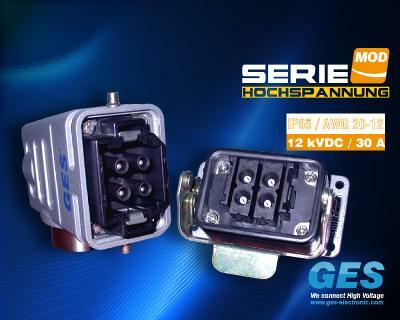 GES Electronic & Service – a leader in high voltage connectivity – introduces a feedthrough-variant of its miniature-series. 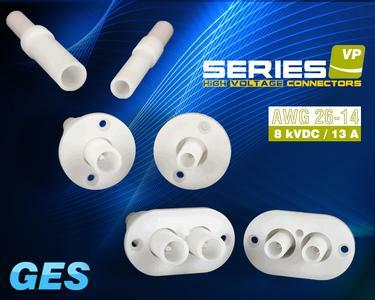 These high voltage connectors in the size of a match are characterized by excellent performance, flexibility and reliability at minimal space requirements, weight and installation effort and are particularly suitable in- and outside of high voltage equipment and appliances in the field of testing & measurement technologies as well as for analysis-, laboratory-, and medical-technologies and power electronics in general. Series-VarioPro Basic is suitable for operational voltages up to 8 kVDC (testing voltage 12 kVDC) at currents of up to 13 A and is available as one- or two-pin feedthrough for equipment installation or as inline-interconnection for a levitating setup. 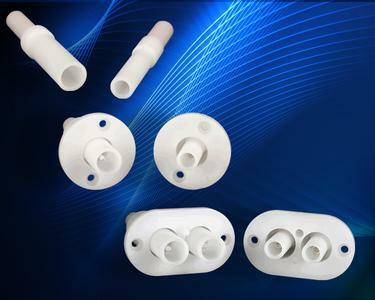 The insulation material POM complies with insulating material group 1 according to DIN IEC 60664 and to flammability classification UL94 HB; the operating temperature ranges from -30°C to 120°C. The 1.6 mm diameter silver-coated crimp contacts are appropriate for AWG 26-14 (0.14-2.5 mm²). The high voltage connectors of GES Electronic & Service are worldwide proven in a multitude of HV-applications and are seen as reliable, durable and well-engineered solutions. VISIT US AT PCIM 2016 IN NUREMBERG/GERMANY (Mai 10.-12. Mai 2016, HALL 7 / STAND 114). 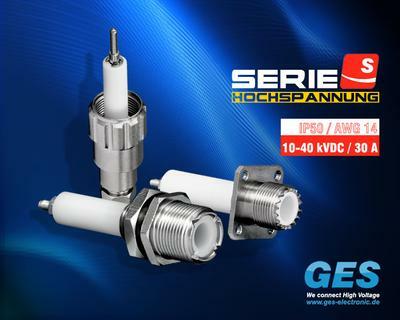 GES Electronic & Service GmbH is a German manufacturer and specialist for high voltage interconnections located in Hallbergmoos near Munich. 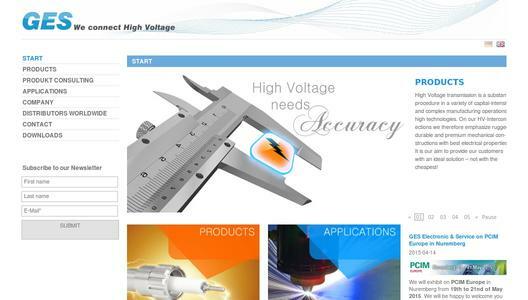 In addition to their standard products GES Electronic & Service GmbH also provides great competence for customer- and application-specific designs and adjustments. 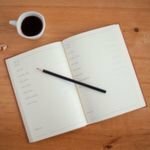 GES Electronic & Service GmbH has been a reliable partner and OEM-supplier to customers throughout Europe, the United States and worldwide for almost 25 years. The products of the company are proven manifold and worldwide in a multitude of high voltage applications and are seen as reliable, durable and well-engineered solutions within their segment.